Our Port Coquitlam movers have been moving people throughout this city since 2005. As a result, they know how to move people stress-free in this neighborhood. If you still have not arranged your move with any reliable moving company in Port Coquitlam, try ours. We are confident how our professional movers move you hassle-free. Our moving company in Port Coquitlam covers all kinds of move in all neighborhoods. We cover Birtchland Manor, Central Port Coquitlam, Citadel, Glenwood, Lincoln Park in Port Coquitlam. Also, we move people in Lower Mary Hill, and Oxford Heights in this city. HOW DO WE MOVE PEOPLE IN THE CITY OF PORT COQUITLAM? As you know, moving is a stressful process for anyone. Imagine, you are moving to a place like Port Coquitlam City Hall. Especially, in recent years that port Coquitlam real estate has grown dramatically. Needless to say, you might provide a U haul truck or any rental trucks. For driving a big rental truck you need experience. It is not just driving. The actual moving job is also difficult. However, with our skilled furniture movers in Port Coquitlam, you will not have to worry about any of that. Our experienced drivers can get our trucks into the tightest spaces you can imagine. Our professional local movers are experts at angles and getting big items into small areas. You will see, we will treat your move as if it is our own. If you are in need of residential moves, commercial move, or office move within Port Coquitlam and surrounding areas, make sure to get in touch with us. We are a full- services moving company. In other words, we provide full packing and moving services in this city and surrounding areas such as Maple Ridge, Port Moody, and Coquitlam BC. Talking about packing services, you might consider using our plastic boxes for your move which are free of charge in your city when your minimum time is or over 5 hours. We provide free of charge delivery for dropping off the boxes at your current address and pick them up free of charge at your new address. You have these boxes for 20 days free of charge for your move. For more information, please watch this short video to know how it works. In fact, as a Burnaby moving company, we have easy access to Port Coquitlam for providing a free quote, and also delivery free plastic boxes to make your move much easier. Besides, as the delivery of the boxes is free, you have the option to buy your other packing material from our moving company. For example, if you need bubble wrap or wrapping paper, we can deliver them beside the free delivery of plastic totes. Our moving supplies are really inexpensive comparing your neighborhood moving supplies. In short, if you looking for a reliable Port Coquitlam moving company, we have the expertise to get the job done.No job is too big or too small for us in this city. 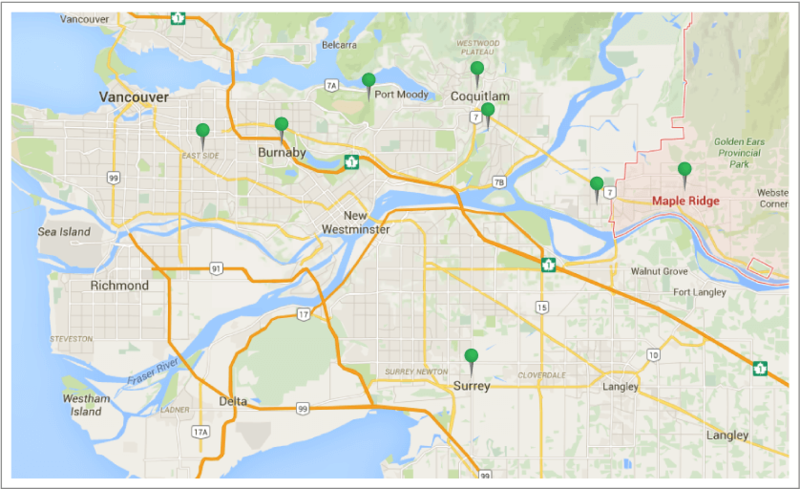 Most of the times, our moving vans are around Port Coquitlam and surrounding areas. Thus, please do not hesitate to contact us for your small and local moves or deliveries. If you are looking for highly recommended moving companies for your upcoming local or long distance moves, consider Metro Vancouver Movers as your first choice. Our moving company is without a doubt is one of the best moving companies, Port Coquitlam BC. Please contact us for a free estimate at your place if you need more information. We prefer working in Port Coquitlam as it keeps our transportation and travel costs down – saving you money! Our professional movers service from Citadel & Shaugnessy Street and all the way to Douglas Island & Colony Farm. We will service East of Port Coquitlam as well , however, there may be a small fee for the extra travel time. Medium size move Most Popular!